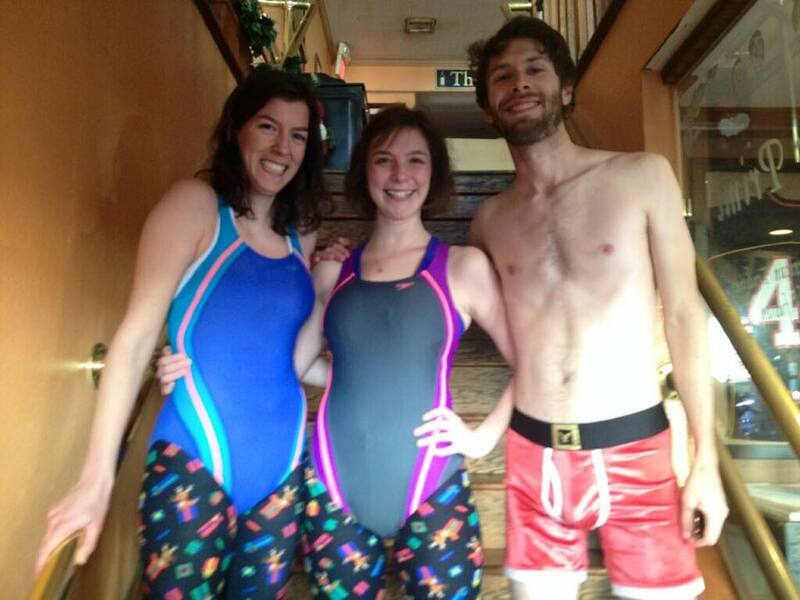 The Run-Around: You Can Get Exercise, Help Small Children, and Wear Your Swimsuit -- All at Once! Don your speedo to dash in Annapolis's 12th annual Santa Speedo Run. Now that Thanksgiving is over, we've officially moved into the holiday running season: one of my favorites! Despite the cold, people gather all over for jingle bell jogs, Christmas cookie dashes, reindeer runs, you name it! But the Annapolis Santa Speedo Run on Saturday, December 15, definitely takes the cake for the most fun. I first ran the race in 2016 and didn't really know what to expect. Would people really wear Speedos? Was it going to be freezing? How intense was it really going to be? Here are the answers: yes, yes, and not very. The goal of the run is to spread Christmas cheer, make downtown shoppers and tourists laugh, and donate to Toys for Tots. Basically, we flooded the Main Street sidewalk downtown in ridiculous costumes, Christmas colors, and swimsuits. Then we sprinted up the street and back down before stopping at O'Brien's for the after-party. I'm pictured in the middle at O'Brien's for the 2016 Santa Speedo Run. I cannot recommend this race enough: The energy (and the cause) makes standing in the freezing cold completely worth it. Standing in the middle of the street with hundreds of other mildly buzzed runners and holiday enthusiasts feels like an amazing and strange cross between being a kid waking up on Christmas morning and being back at one of those crazy college parties. It's fun and sentimental all at once. Plus, the t-shirt you get to take home is hilarious. There's nothing like sporting a vibrant red shirt with a portly, bare-legged Santa running across your back. Great year-round. The cost of registration goes toward Toys for Tots, but they also ask that you bring an unwrapped toy or book to add to their donation box. Justify your guilt about running a short distance and drinking a beer around 10:30 in the morning by participating in this holiday tradition made easy (they put the box right at the start/finish line). So if you're looking for an active and fun way to celebrate the holidays, the race is on December 15 this year. See you there! Do you like paddling? Just because it's frigid doesn't mean you can't go now! Learn more here!